The amazing tales of the knight Theuerdank (alter ego of Emperor Maximilian) and his companion, Ehrenhold, comprise the last great epic verse of the late Middle Ages. The courageous knight's journey to woo his future wife, Mary of Burgundy, and his triumph in battles and other dangerous situations are the focus of this highly embellished “real-life” story of Emperor Maximilian I (1459–1519). King of Germany before becoming Holy Roman Emperor in 1508, Maximilian was a great patron of the arts and commissioned a trilogy of ornate, illustrated books to immortalize his existence. Theuerdank, the only volume to be published during his lifetime, was composed by Melchior Pfintzing based on Maximilian`s rather fanciful draft. 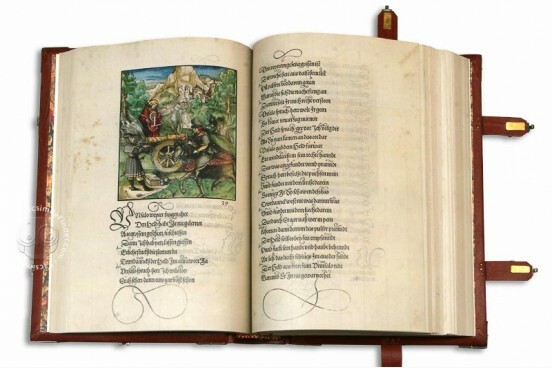 The 118 ornate, gold-adorned woodcuts – one for each chapter – were made by Hans Burgkmair the Elder, Hans Schäufelein, and Leonhard Beck, while the typeface (known as the Theuerdank typeface and characterized by its striking “elephant trunks”) was specially designed for the book by the printing workshop of Hans Schönsperger the Elder. Produced in 1517 in Nuremberg, this triumph of book design has been described as one of the greatest books of the German Renaissance. Maximilian I (1459-1519) – archduke of Austria, German king, and Holy Roman emperor (1493-1519) – was an important patron of the arts in the sixteenth century. We can safely say that he was one of the first humanist emperors of the Renaissance, enthusiastic about new scientific inventions as well as the arts. He made his court a major centre for the arts. Maximilian supported music, planned grand architectural monuments, collected an important library and encouraged printing. He was also highly interesten by his family history, commissioning genealogical studies to provide him with eminent ancestors including Caesar, Charlemagne and King Arthur. Maximilian himself was a prolific author, too. The Teuerdank is traditionally ascribed to him, however it should more correctly be attributed to Melchior Pfintzing, his chaplain, who worked extensively on the text in accordance with the Emperor’s instructions. Some commentators also credit Maximilian’s secretary, Marx Treitzsauerwein, with some responsibility for the writing. Certainly, the whole concept took a long time to complete: originally planned in 1505, the poem did not near completion until 1512, and took a further five years to be produced. The story is a long allegorical courtly poem written in rhymed couplets, a fictionalised account of the adventures of Maximilan. He travels to the Netherlands in 1477 to claim his bride, Mary of Burgundy, and her kingdom. The Emperor is portrayed as the chivalric knight, Teuerdank (the name roughly translates as ‘noble thought’) accompanied by his trusty companion Erenhold. The story begins when Romreich (Charles of Burgundy), the father of Erenreich (Mary) dies. Throughout his journey Teuerdank encounters no less than eighty different life threatening adventures. These are engineered by Erenreich’s most powerful vassals – Fürwittig, Neidelhart and Unfallo – whose power is threatened by Teuerdank; they therefore try to kill him, thereby preventing the marriage. Thus, Teuerdank encounters dangerous hunting expeditions in which he is given unsafe weapons; he is led into the path of organised ‘accidents’ such as broken staircases, rockfalls and snow slides; he is given poisoned food to eat; he sets sail in stormy seas and his ship goes on fire; mercenaries are paid to engage him in jousts. Ultimately, of course, our hero overcomes these perils by his bravery, foresight, skill and knowledge. The treachery of his three adversaries is revealed and they are executed. The book ends as Mary promises to marry Teuerdank on the proviso that he first furthers his honour by undertaking a crusade against the Turks. One of three autobiographical texts planned by Maximilian, the Teuerdank was the only work finished in his lifetime. The Weisskunig (‘White King’) was to have been the first instalment, celebrating his childhood and youthful exploits; although 237 illustrations were made for this, it was not published until 1775, in a fragmentary version. The last part, the Freydal, was even less complete when Maximilian died in 1519. The Teuerdank, meanwhile, enjoyed considerable success. While the first edition of 1517 was intended for private distribution, an edition for general sale appeared two years later and subsequent editions were produced regularly throughout the sixteenth century. Contemporary enthusiasm for it has been attributed partly to Maximilian’s popularity and partly to its striking illustrations and fine design. As a work of literature, it is disparaged by the Oxford Companion to German Literature for having wooden verse and repetitive construction. Others go so far as to dismiss it as having no literary value. The full title of the work, as shown here, translates as The adventures and a portion of the story of the praiseworthy, valiant, and high-renowned hero and knight, Lord Tewrdannckh. Originally printed on vellum, the book was made with a special font of ornamental type, characterised by enormous flourishes. At first glance, this is often mistaken for manuscript. This black-letter typeface was based on a gothic script used in the Imperial Chancery; it was first used in 1513 in the Prayer Book of Maximilian I. A later version of the type came to be known as ‘Fraktur’ type. Considering that the book was produced only some sixty years after the introduction of printing by moveable type, its fine execution is all the more remarkable. It was printed by Hans Schönsperger, the Elder. In 1508 he had been appointed for life as Maximilian’s printer. The result of his work was a major achievement, although by no means perfect: mistakes in the original typesetting have been carefully corrected throughout by means of pasted lines of text. Printed book on parchment − 34.5 × 23 cm − 648 pp. 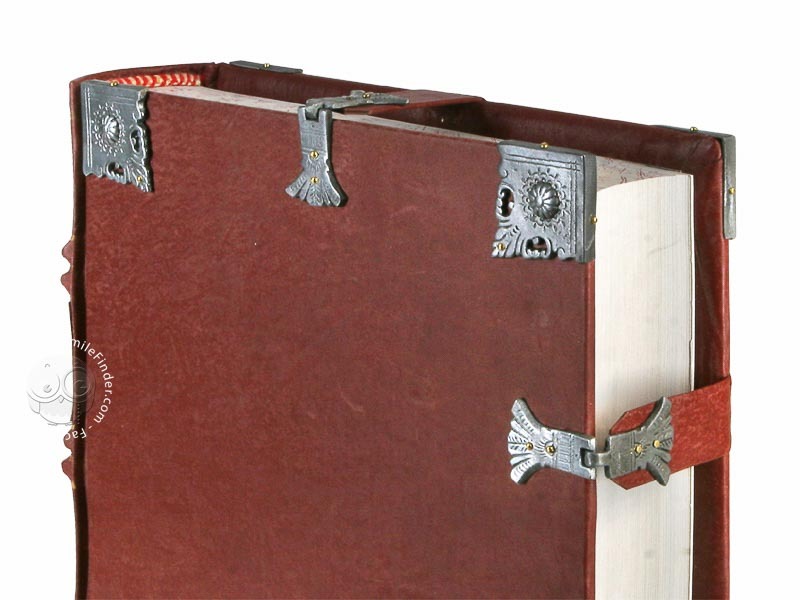 Full-size color reproduction of the entire original document, Maximilian I and Melchior Pfintzing Teuerdank: the facsimile attempts to replicate the look-and-feel and physical features of the original document; pages are trimmed according to the original format; the binding might not be consistent with the current document binding. 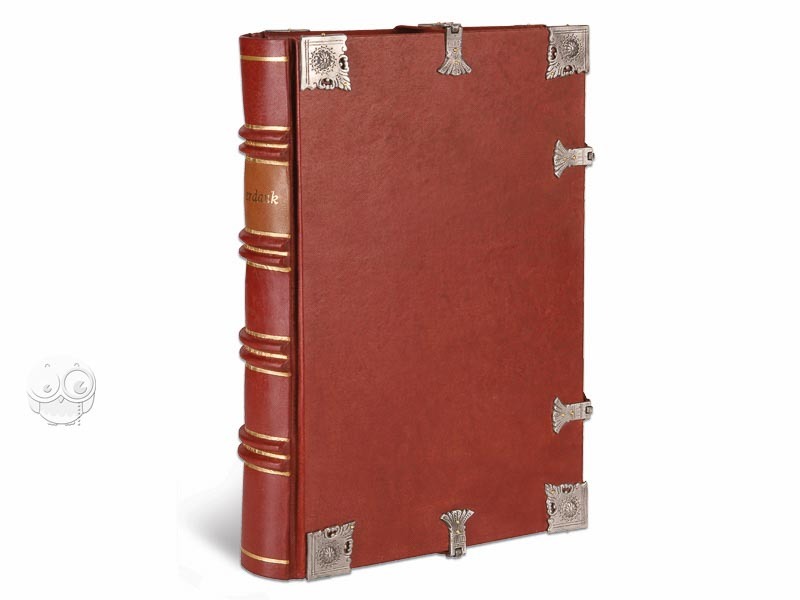 Real leather with golden decoration and hand-sewn on ribs.